Marriage of Lord Subramanya and Valli woven into a musical sequence and handed over traditionally through Guru shishya parampara since 400 years. After Sura Samhara by Muruga , two girls , Aanandavalli and Sundaravalli emerge from the tear drops of happiness coming out of Shiva’s eyes. Muruga, who is the younger brother of Ganesha had promised to marry both. 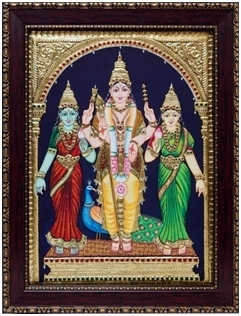 Aanandavalli is born as Devendran’s daughter & marries Muruga. SundaraValli is born as daughter of a hunter tribes man in Thiruveragam. Ganesha assumes elephant form and frightens Valli. Thereby Muruga comes in the form of an old man and saves her. He asks her to marry him since he saved her.As she refuses and says she will marry only Muruga, he reveals his identity and marries her.The musical event is woven around this story, following HariNaamaSankeertan Paddathi.